Updates for our Kauai seals and pups. RK30 weaned her pup, PK1. This pup most likely nursed 49 to 50 days, making this a very big pup. On Monday, June 27th, she was tagged and vaccinated and is now, officially, RH38, (tags H38/ H39). RK22 weaned her pup, PK2, on Sunday, July 2, after 41 days of nursing. RO28 arrived from Oahu and pupped, PK3 on June 15. Both are doing well. PK3’s first recorded nursing bout with RO28. 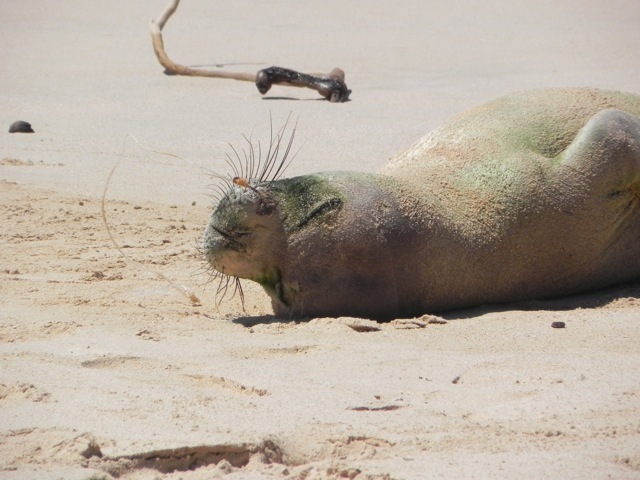 The Kauai coordinators are in the process of vaccinating Kauai seals against Morbillivirus, a disease that causes measles in humans and distemper in dogs. To protect our rare Hawaiian monk seals, the first ever vaccination of wild seals has been initiated, as epidemics of this deadly virus have devastated other seal species populations around the world. So far, 13 Kauai seals have received their initial vaccination and some their second booster shot. We are now earnestly looking to booster several male seals, and volunteers can assist us by looking out for RF28 ( red tags, and transmitter on his back, on the north and east sides of Kauai), and N1AA (black tags on the south and west sides of the island). Also, RN30, R8HY subadult males found primarily on the east side often Ahukini cove. Here is a video of how seals are vaccinated. We will put out a list as time goes on, to identify which seals we are looking for to booster in the 3-5 week window and would truly appreciate assistance in looking for them. RF28 and RF30 released and doing well. On May 27, RF28, a juvenile male seal, was found with an ingested hook that was successfully removed on Oahu by a veterinary team. He was soon released back on Kauai with a transmitter on June 2. A week later, we were surprised to find another internally hooked seal, RF30, a juvenile female! She was located at the Poipu county beach park keiki pool where she was logging and acting strangely. A team was assembled for a water capture using fence panels and crowding boards. This challenging capture was successful due to our many fine volunteers that rallied on a very short notice. Without volunteers to find and assist with capturing these injured seals, none of these successes would be possible! We supremely need and appreciate all our volunteers! RF30 was also transported to Oahu by a US Coast Guard C-130. She was found to have some swelling in the throat where the hook was lodged and at the base of the tongue. It was successfully removed using an endoscope and specially designed tools. Four days later RF30 was flown back to Kauai and released on the east side of the island where she normally resides. Both seals are fitted with satellite tags that are solar powered. View sea turtles from a distance of 10 feet (3 meters). In Hawai‘i, we view turtles respect- fully. Give turtles space and don’t feed, chase, or touch them. push them back into the water. RELEASE with no (or as little) gear or line attached. “No white light at night.” Use wildlife friendly lighting near the coast (yellow/amber and shielded lights). Don’t use flash photography, and keep lights and beach fires to a minimum from May to December, when turtles are nesting hatchlings are emerging. Avoid beach driving. Off-road vehicles crush nests, create tire ruts that trap hatchlings, and degrade habitats. Driving on the beach is also illegal in most areas. Prevent debris and rubbish from entering the ocean. Participate in beach and reef cleanup activities. 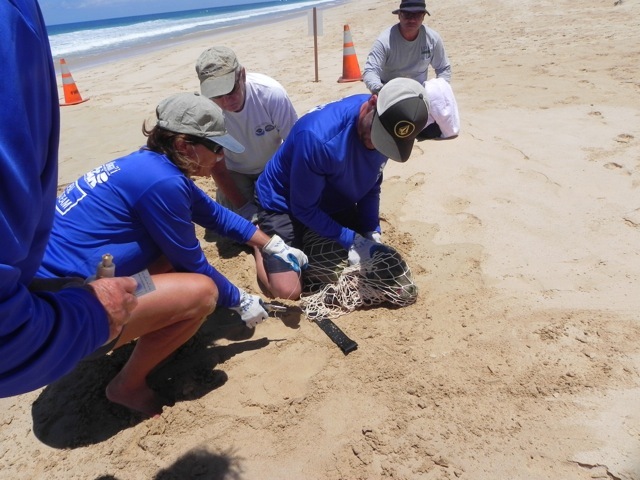 Report all hawksbill sea turtle sightings, any nesting activity (turtle tracks or nest digging), and injured or dead turtles to NOAA’s Sea Turtle Stranding Hotline on Kaua‘i: (808) 274-3344. We tallied the efforts of our 100+ member volunteer network over the past year and are excited to share the numbers with all of you. The gradual increase in seal sightings and numbers clearly show that monk seals are doing well in the Main Hawaiian Islands. We want to emphasize that it is the efforts of our volunteers that make this possible!  Grand sightings total: 3,321 (9.1/day) monk seal sightings on Kauai in 2015 (up from 2,516 in 2014 or 6.9 seals/day)! Stranding: 6 monk seal responses.  RN44 – circle hook removed from cheek at Larsens Beach. Full recovery.  RF22 – found dead, cause of death was propeller strike.  RF28 – ingested a circle hook. Transported to Oahu for surgical removal, released at Waipake after successful hook removal.  RF28 – follow-up capture/exam due to flipper lameness. Minor laceration discovered, seal fully recovered from hooking.  N1AA – J hook removed on the beach at PMRF. Full recovery. Back in April of this year, a juvenile male, new to Kauai, showed up on the Kapaa shoreline and was tagged by our Kauai team as R1KD (1KD in left rear flipper, 1KG in the right rear flipper). The very next day he was found with a circle hook embedded in his left cheek. We spent the next week searching for this seal and finally were able to cut the line attached to the hook. We were unable to get a capture crew there quickly enough to remove the hook. Over the next 4 months, this seal was spotted occasionally on the remote Na Pali coastline looking healthy and strong, but still hooked. Last week we sent a team via boat to the Na Pali coast specifically to scout for this seal, but we were unfortunately unsuccessful. The fact that his body condition has been reported as good indicates that the hook is not affecting his ability to forage. Seals can typically shed hooks themselves, however 4 months is a bit longer than most so we remain on alert. If you see this seal please call the Kauai hotline at 808-651-7668. Another small seal, N1AA, was tagged on Niihau in 2014 and bears the first black tag specific for Niihau seals. 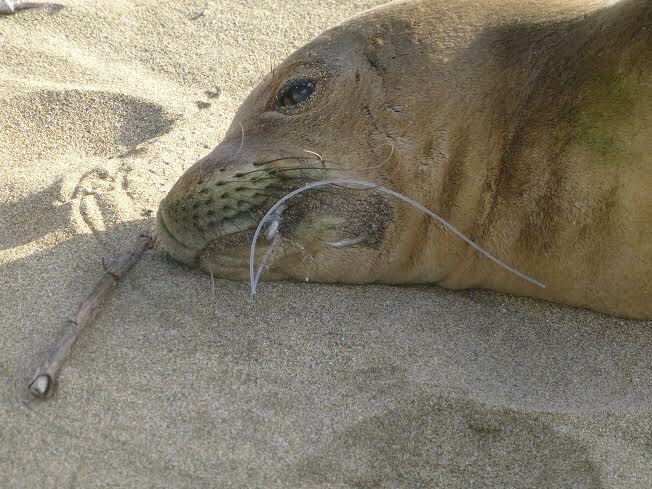 He has been sighted at various locations on Kauai over the past year including the west side where he hauled out with a hook protruding from his muzzle in July. We were able to quickly deploy a de-hooking team, and to easily remove the hook. Most hooks we encounter are barbed, so the technique we use is to cut the hook in half and remove the two halves rather than attempt to back the barb out in reverse. In this case, the hook was barbed originally, but had corroded away and made the de-hooking process very fast and painless for the seal. If you fish, please consider using barbless hooks and encourage others to do the same.